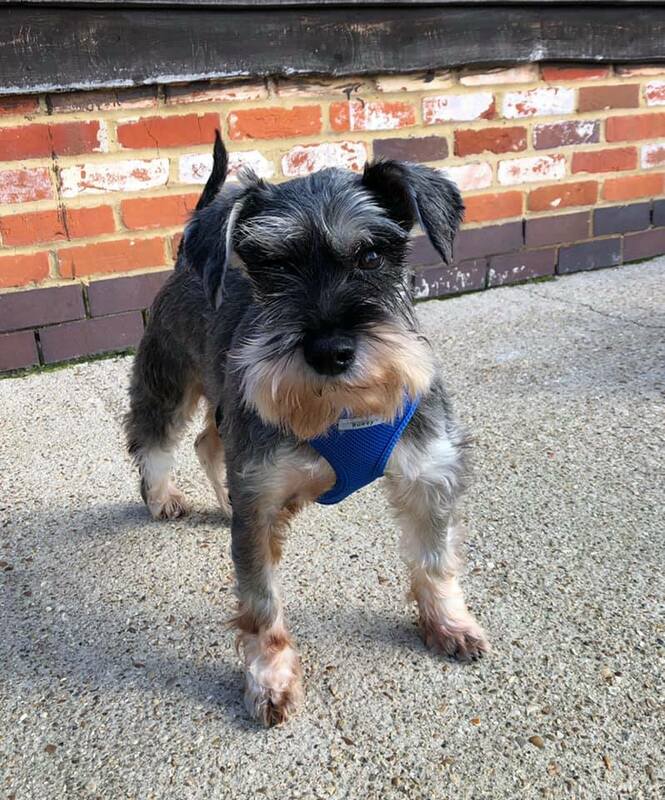 Hansel was one of several miniature schnauzers who arrived together at the Diana Brimblecombe Animal Rescue Centre having escaped the nightmare of life in a puppy farm. It was clear that he would need time, patience and complex veterinary treatment before he could be found his new home. DBARC provided the perfect place of peace and professional care for this sensitive dog while he spent a few months recovering from years of neglect. Like many dogs from this background, Hansel required serious dental work, neutering and a few other procedures. He also had cataracts which in due course DBARC planned to have assessed and if possible, operated on. Restoring his sight would be done before he went off to his new home; this specialist, complex veterinary treatment is made possible through the kind of fundraising Schnauzerfest has committed to doing for DBARC since 2014. Hansel spent his first Christmas outside of a breeding facility being fed a healthy, delicious dinner, served by DBARC friend and volunteer Julia before opening his first ever Christmas gifts. All the special touches which DBARC offer creates a gentle sense of loving safety for all the animals in their care. This is never more important than with dogs like Hansel who haven’t previously known normal, human kindness. It can take a long time for many of them to realise that they are in a safe place, even when surrounded by caring human beings. For some, the traumas run deep and are long lasting. As a dog with cataracts, Hansel faced additional challenges to settling into life outside of the puppy farm. But with the dedication and care given by DBARC staff and volunteers by the new year he was ready for the next major stage of his journey - cataract surgery. Under the expert care of the ophthalmology department at The Ralph in March 2019 Hansel underwent eye surgery. Luckily for him, shortly before undergoing this treatment, it was decided that he would be fostered by the same family who adopted Gertie and Violet. Following his surgery, it became official, Hansel was being adopted!